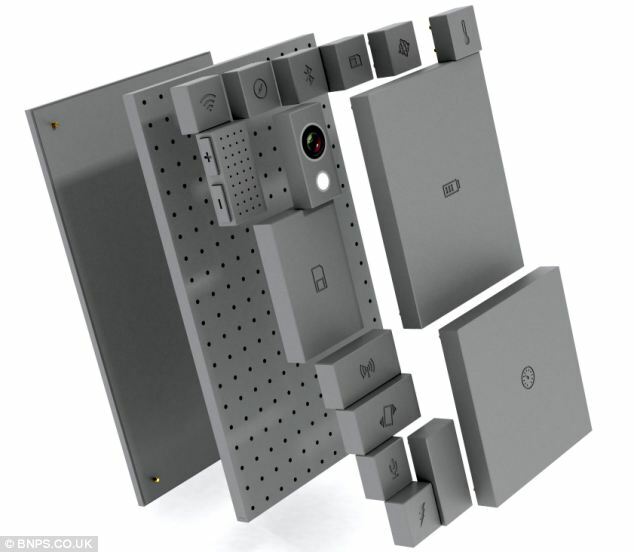 Google’s much-anticipated modular smartphone could be available in January 2015 for as little as $50 (£30). The Project Ara 'Grey Phone' will consist of a simple frame, screen, Wi-Fi connection and processor with users able to customise it with various plug-in modules, colours and accessories. Paul Eremenko, Google’s Project Ara head, revealed the date to attendees at the company’s developer conference this week and has outlined further plans for the device. The phones will be able run on multiple batteries - when one battery dies, it can be detached and replaced with a full battery module. Lower-resolution cameras can be swapped with higher-res versions, and users will be also be able to 3D print replacement parts. Google's kit describes various modules including batteries, Wi-Fi and Bluetooth chips, cameras, speakers and more. Each phone will have a central 'spine' and an endoskeleton that individual modules will clip on to. WHAT DO WE KNOW ABOUT THE PROJECT ARA GREY PHONE? 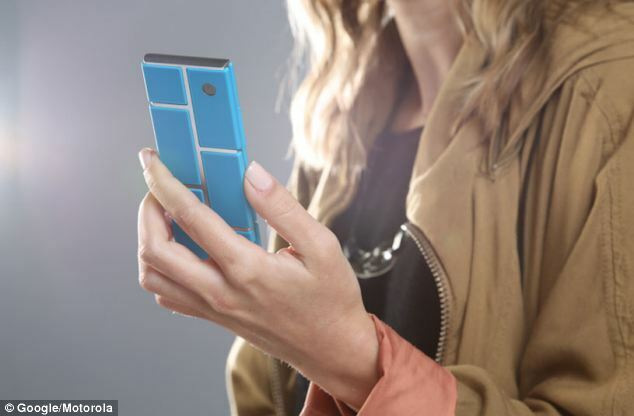 Google’s modular smartphone could be available in January 2015 for as little as $50 (£30). According to an earlier developer kit, Ara phones will be able run on multiple batteries - when one battery dies, it can be detached and replaced with a full battery module. Each phone will have a central 'spine' and an endoskeleton - nicknamed 'endo' - made of ribs that the individual modules will clip on to. There will be three different sized endos - including mini, medium and large - to rival the existing range of phones currently on the market, from compacts to phablets. Larger phones will be able to accomodate either larger, or additional modules, than the mini will. In theory, any sensor that can be fitted to a module will be able to attach to a module and while Google will make the shell, these modules will be made by other companies. By printing their own parts, users will also be able to customise them. Google has revealed each phone will have a central 'spine' and an endoskeleton - nicknamed 'endo' - made of ribs that the individual modules will clip on to. 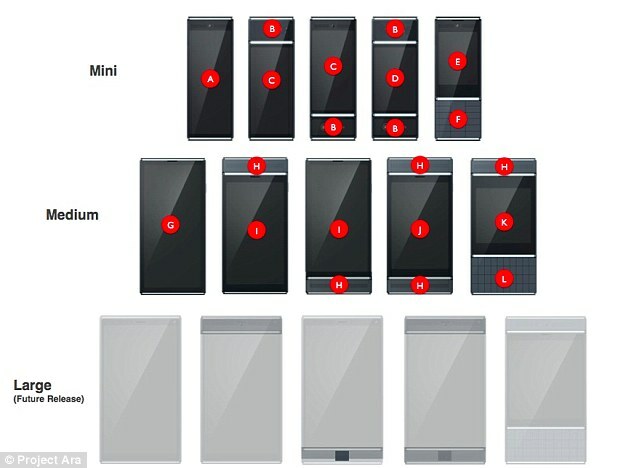 Larger Grey Phones will be able to accommodate more modules than the mini will, for example. In theory, any sensor that can be fitted to a module will be able to attach to a device, and while Google will make the shell, these modules will be made by other companies. At the developer conference, Google outlined a time frame for development for the modular device, attempting to attract hardware and software developers. The main frame of the Grey Phone will be built to last around five to six years, according to Mr Eremenko, allowing users to upgrade their phones regularly. He added that the basic framework can be used to build any number of devices, beyond a simple smartphone. ‘If it can be other things, we encourage that,’ Mr Eremenko said but added that Google intends Ara to be ‘ultimately a great smartphone first and foremost’. Project Ara was developed as a result of Google’s purchase of Motorola and its Advanced Technology and Projects group. It is based on the Phonebloks designs by Dutch inventor Dave Hakkens. It was initially assigned to Motorola, and had been planned to add to the firm's existing range, but Google sold the phone maker to Lenovo in January. 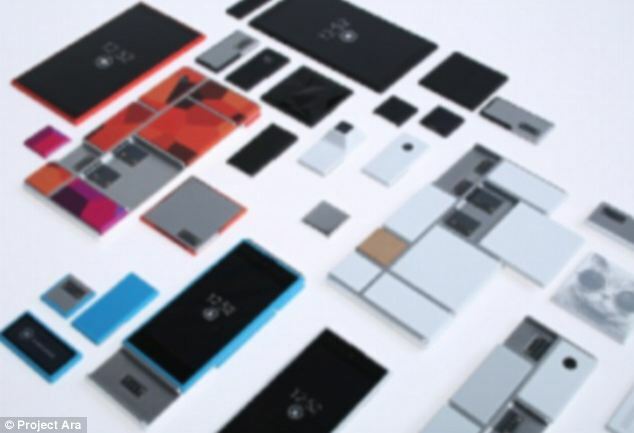 Google's Project Ara is based on the Phonebloks designs by Dutch inventor Dave Hakkens.